When people ask me about character development in my books, I am at a bit of a loss to explain my process, which is sometimes mysterious even to me. My characters are people, and people are generally unpredictable and occasionally uncooperative. Of all the aspects of my writing, I feel that I have the least control over my characters. Sometimes we have a partnership in the crafting of the story. Sometimes they just flat out control me. Let me back up. When I start a project, it is always with the idea. Usually, a premise – simple, but odd – pops into my head. For my debut novel, We, a person travels back in time where that person is trapped inside the brain of his or her younger self. 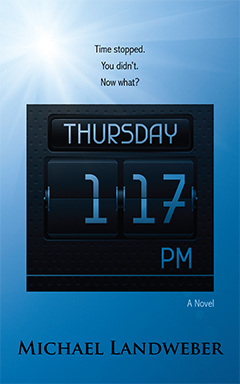 My new novel, Thursday 1:17 p.m., also was concept first – time stops and only one person is left moving. In both of these cases, I knew that there was a main character, but that was it. That person didn’t even have a gender. Forget about names – those come way later. Before I know my main character, I have to meet the candidates. This is a little like mingling at a cocktail party in my brain. All these different possible characters are there vying for my attention. In real life I’m really bad at navigating social situations like this. Somehow that translates to my imagination too. Choosing characters should be like a casting call for a movie. I should be auditioning actors and picking the right one based on a confidence stemming from knowing who I’m looking for. Instead, I sort of flail around for a while, hoping to bump into the right character. Like in real life, sometimes I forget to ask them the right questions. Or I have trouble hearing what they are trying to tell me. Sometimes I just stand quietly in the corner and hope someone comes to talk to me. At the genesis of a project, that cocktail party can be a little chaotic. I get snippets of characters’ lives. You say your mother was a hoarder? Interesting. You’re an astronaut? That could work. Or not. Seventh son of a seventh son? Yeah, maybe a little too scary for this book, but thanks for coming. Everyone in the room is an amalgamation of demographics and quirks and family histories, none of which seem quite right for what I want to write. Eventually, the room thins out and I’m left with just a few options. Some of them have picked up characteristics of suitors who left something behind. Eventually all that detritus gels into a single person, hopefully fully formed. That’s the character that moves on to the novel or the story, working with me to craft a cohesive story. The problem is that sometimes it is the wrong character. That’s what happened with the early drafts of Thursday 1:17 p.m. The premise of time stopping naturally is going to lead to a certain degree of loneliness and alienation for the solitary character who isn’t stuck. The original character was an early twenty-something recent college grad. He didn’t seem to have any friends. I didn’t really know his family. He didn’t have any discernible goals for the future. And since he was a first-person narrator, I wasn’t even sure what his name was. At the time, all of this seemed OK for a character who was stuck in a world where time stopped. Unfortunately, starting with a character so disconnected even before time stopped led naturally from isolation to madness to some very unfortunate serial killer like behavior. I had to let him go and start over. That’s when my eventual narrator, Duck, wandered by. He was a seventeen year old whose birthday was the day after time stopped. He was literally being denied the opportunity to become an adult. He told me about his family – a sad story but a poignant one. Duck had friends. He had an unrequited crush on a girl. And everything he was telling me fit perfectly with the story that I wanted to tell. That’s my secret of character development. For me, it’s not about knowing every detail about a character’s life. It may be important to know a character’s favorite color, but most likely it isn’t. What’s important is that the character helps me figure out the story I want to tell. In Thursday 1:17 p.m., Duck wouldn’t let me write something that wasn’t something he would do. I know it sounds a little crazy to talk about my characters as real people who discuss plot points with me, but that’s how it feels when I write. That initial awkward cocktail party leads to some lasting friendships. OK, you’re right, I need to get out more and talk to some real people. But first let me write another chapter of my next book. Michael Landweber lives and writes in Washington, DC. His short stories have appeared in literary magazines such as Gargoyle, Fourteen Hills, Fugue, Barrelhouse and American Literary Review. He is an Associate Editor at Potomac Review and a contributor to Washington Independent Review of Books. Michael has a soft spot for movies about talking animals and does not believe he would survive the zombie apocalypse. His first novel We was published in 2013. So true. A well-defined character will surprise you at every turn. I find the more they fight you to do what they want the more 'real' they are. Knowing the characters the way Michael does makes them essentially humans, less 'fictional' and more real. Great reading! This was an interesting post to me as a non-fiction author. Since my characters are "real," I don't have to go through this process. I like to base characters off of real people. I can honestly say that my exwife has been eaten by a dragon, killed by trolls, and stepped on by a giant.